Amazon’s acquisition of Whole Foods makes sense. I enjoyed deconstructing why below. In-store shoppers are extremely common and have been asked to stop wearing Instacart t-shirts so as to not change the feel of the shopping experience for other customers. 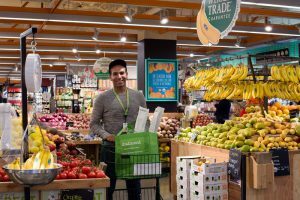 workers shopping for delivery-platform customers such as Instacart and Whole Foods own delivery service. These shoppers are extremely common in Whole Foods, and they have been ever since Instacart started doing deliveries from their stores. While they no longer wear t-shirts that indicate the platform for whom they are working (this isn’t an accident), these shoppers are pretty easy to pick out from amongst the crowd. They wear headphones, stare intensely at their phones as if reading a off a list, fill grocery carts with large orders, talk with store clerks as if they are colleagues, and move briskly from one item to the next. They become efficient shoppers, knowing where everything in the store is located and they have their own checkout lines in the store so that they can complete as many orders as fast as possible. But watching these shoppers go around and pick items to assemble orders, you can’t help but see this labor force as very replaceable by warehouse robots and machinery that Amazon already uses to assemble orders from large warehouses with thousands of SKUs. Now that Whole Foods offers its own delivery service (delivery.wholefoodsmarket.com), expect Amazon to put its mighty marketing and operations competencies behind the delivery service to not only make them less dependent on Instacart going forward but to also move all assembly of delivery orders to a warehouse environment so as to improve the in-store shopping experience for customers. 2. Overlapping customer bases enables better customer experiences for the Amazon and Whole Foods customer of the future. 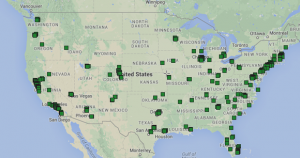 Whole Foods stores are located in affluent neighborhoods of metropolitan areas. Like Whole Foods stores, Amazon customers are located in more affluent neighborhoods in metropolitan areas. Walmart’s core customer lives in rural areas. Whole Foods and Amazon customers value convenience and a higher-quality experience over rock bottom prices; and they are willing to pay a higher price for it. Both Amazon and Whole Foods customers value pleasant and efficient shopping experiences that save them time. Amazon’s entrance into various product categories means that customers can efficiently procure many services and goods from a single entity. Like Amazon customers, Whole Foods customers are accustomed to the convenience of high-quality, curated stores and SKU availability. As a result, many Amazon customers are already Whole Foods customers, so this acquisition will mean that Amazon can gain greater share of these existing customer’s wallet. With greater data collection and insight into each individual customer and their shopping history, Amazon will leverage this data to make better recommendations and inventory management decisions, both of which will also potentially lead to increasing total expenditures by each customer. 3. Massive cross-marketing opportunity to create new Amazon customers. Within the Whole Foods customer base, there a few segments who may not be Amazon customers yet. Imagine the older, not-so-tech-savvy segment of Whole Foods customers who shop there purely for the higher quality food and shopping experience. These customers are the type of people who don’t do a lot of e-commerce but regularly procure their food from Whole Foods because they have grown to trust the Whole Foods brand. Amazon will be able to leverage this brand equity, and cross market to these segments to attract new Amazon.com and Prime customers. And once the customer is brought into the fly wheel, there is a high likelihood that the customer will become a consumer of Amazon’s other stores and products, such as Amazon Video, Audible.com, etc. This entry was posted in business strategy, insightful?, marketing, retail by Jason. Bookmark the permalink.